There is NOTHING like the smell of fresh rosemary. Especially when the smell lingers in my house after I've cooked something like this! 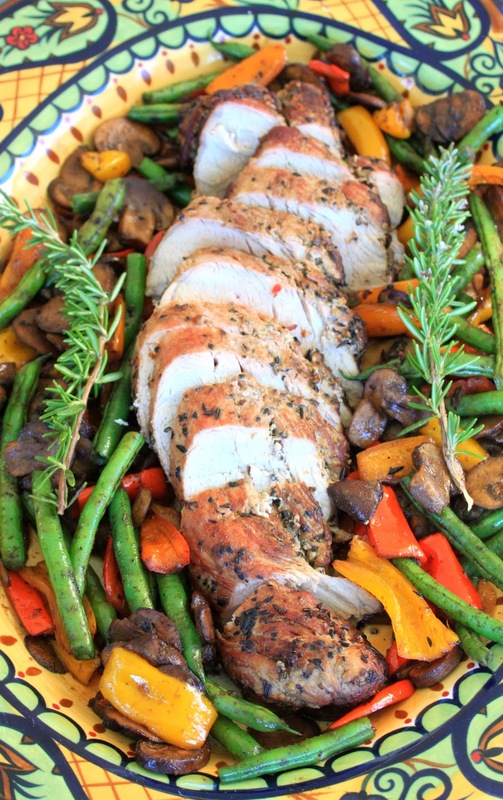 Pork Tenderloin is lean, juicy, tender and EASY to cook. If you're not the "make it from scratch" type, Trader Joe's has a garlic marinated pork tenderloin that you could very easily use for this recipe and just add some chopped, fresh rosemary to the pan while you're searing it. You can use any veggies you want for this also, potatoes would be great for a complete meal, the ones I used today were just what I had on hand. Place the pork tenderloin in a large, sealable plastic bag. Add 2 tsp. each of ground sea salt and cracked black pepper. Add the pressed garlic cloves and the 3 tbsp. of the fresh rosemary. Drizzle in about a tbsp. of olive oil. Seal the bag and massage all the ingredients into the meat for about 1 minute. Place the sealed bag in the refrigerator to marinate for at least 4 hours or overnight. Heat a large skillet to high heat with about 1 tbsp. olive oil. When the oil is heated, add the pork tenderloin and ALL the oil/juices from the marinade bag. Sear the pork for about 3 minutes on all sides, until it has a nice, dark brown color. Remove the heat from the pan, reserve the heated pan and its drippings. Wrap the meat tin foil and place it in a casserole or glass baking dish. Bake in the oven for about 15-20 minutes until inside temperature reaches 135-140 degrees. Remove from the heat and allow it to sit for 10 minutes before unwrapping, slicing and serving. While the meat is cooling, re-heat the large skillet to medium heat and add the peppers and mushrooms. De-glaze the pan with about 1/2 cup water or chicken broth and stir the juices into the veggies. Season the veggies with the onion powder, the remaining tbsp. of fresh rosemary and salt & pepper to taste. Cook the mushrooms and peppers on medium heat for about 5 minutes, until the mushrooms begin to brown. Add the green beans and continue to cook for another 5 minutes, until the green beans are softened, but still slightly crunchy. 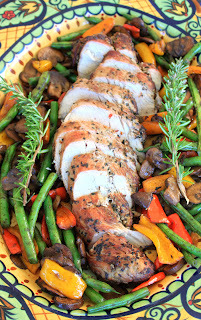 To serve: Arrange the pork tenderloin on a serving dish. Slice it on a bias to create 1" thick slices. Pour the veggies and the drippings from the pan around the sides and serve.